I’ve never been pumped about cooking with raw poultry. Maybe it’s every Clorox commercial with evil, un-cooked chicken breasts sitting on the kitchen counter that always turned me off. Who actually does that? But in reality, chicken in delicious and pretty much the easiest thing to cook as well. So I walked down to the corner market and picked up some ingredients for what turned out to be a healthy and filling dinner (that was even better for lunch the next day). Inspired by this Layers of Happiness recipe, here is my take on Citrus Kale Chicken Bake. You can start by pre-heating the oven to 360 degrees. After pre-heating you oven to 360 degrees, start by chopping your bunch of kale. From the start it will look like a ton of greens to add to the baking pan (9×13 or something similar) but don’t worry, this will cook down tremendously. 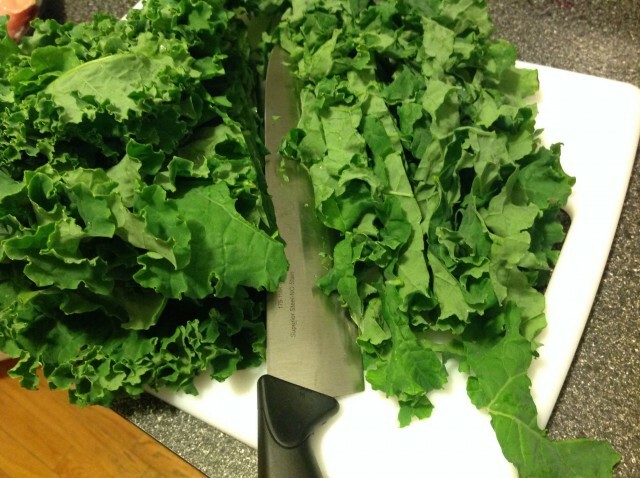 I chopped the kale into long strips and then diced into smaller pieces. 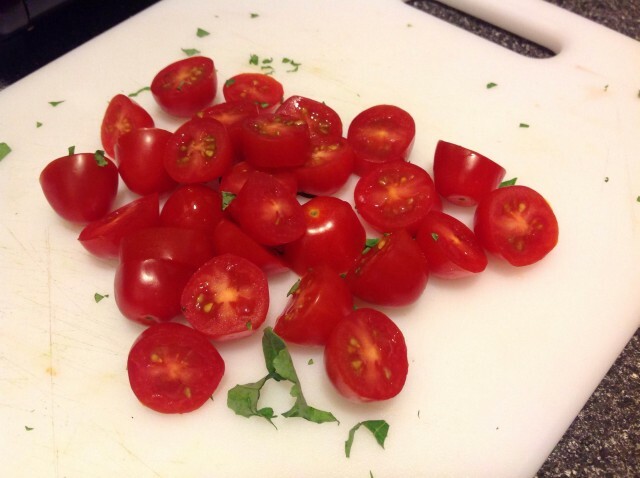 Next, I grabbed a small container of cherry tomatoes and cut them in half so they were all the same size. Add as many as you’d like to the dish. These will mostly keep their shape after baking, but cooked down slightly. Now it’s time to tackle that raw chicken. 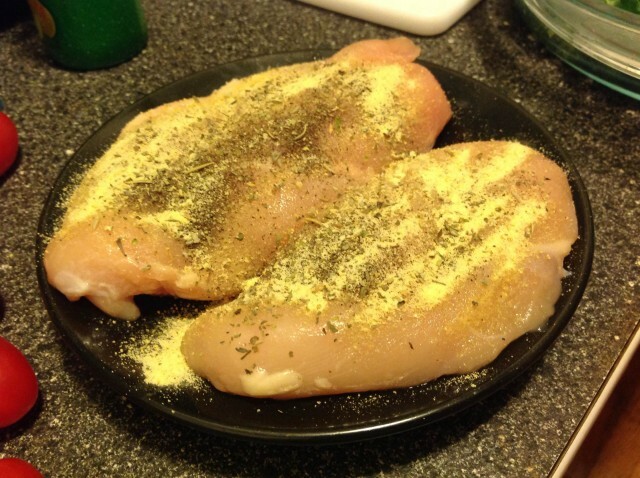 Take the chicken breasts and coat them (on both sides) in the spices you’d like. I used onion powder, garlic powder, salt, pepper and Italian seasoning to start. Additional recipes called for a balsamic marinade instead (which you can make easy with balsamic vinegar or dressing). Now add your chopped kale (if you haven’t already) to the baking dish. This will be the base and bottom of the meal. 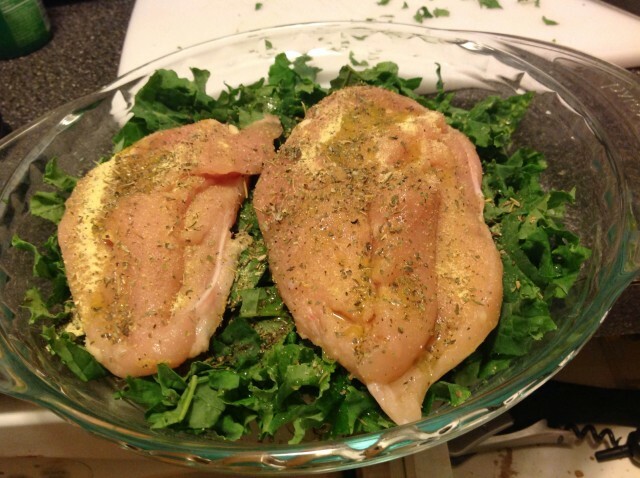 Take the chicken and place them seasoned-side down onto the kale. Then use the same seasonings and cover/coat the top side of your chicken. At this point, you can pour in the 3 Tbsp of white wine in the bottom of the dish. This will keep the chicken and kale moist throughout the baking process. 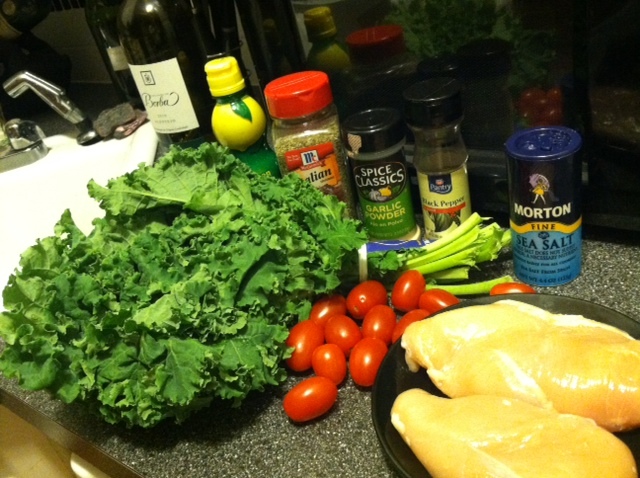 After that, splash a generous amount of lemon juice over the chicken and the kale. Personally, I loved the added freshness to the meal. Top with the cut tomatoes and add any last minute seasonings you would like. We are ready to bake. Cover the dish with aluminum foil for the first 20 minutes of baking. This will keep the chicken from drying out. 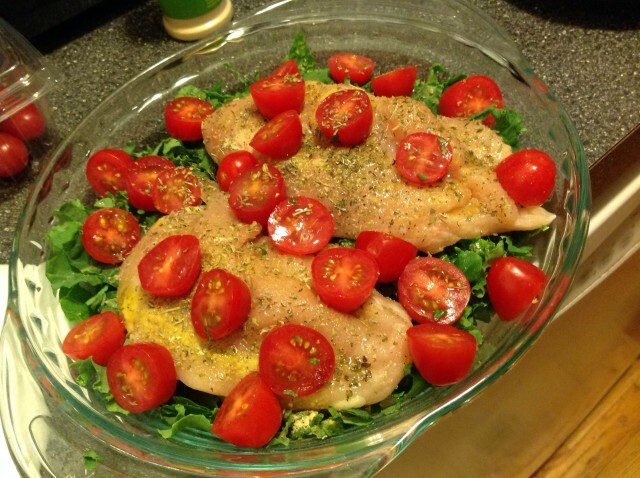 Additionally, be sure to cook the dish uncovered until the chicken in baked through — depending on the oven and thickness of your chicken breasts, this can vary. For me, it took 50 minutes total (including the 20 min covered with foil). The finished product from right out of the oven is pictured above! The kale cooked down a ton from what was originally in the dish and had a great white wine and lemon freshness to it. Paired with the baked tomatoes and chicken, this was a great meal that I would definitely make again. 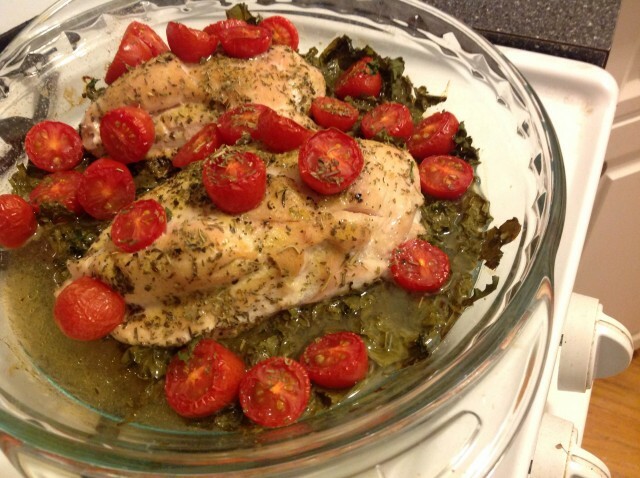 Tags: baked chicken, citrus, dinner, gluten-free, italian seasoning, kale, lemon, recipes, ROOKIE CHEF, tomatoes, white wine. Bookmark the permalink.